We offer customized multi hole probes, rakes and more for measurements in flows and the corresponding post-processing software. Furthermore we conduct probe calibrations in our own on-site calibration wind tunnel. We are also happy to provide consulting! Fluid flows can be easily and precisely characterized with Vectoflow's Multi-hole Probes. They differ from traditionally fabricated through their one-piece integrated design. This makes our probes more robust, easier to clean and they require less maintenance. Our special additive manufacturing process allows for great flexibility in the geometry and a wide range of materials. Our probes can be easily integrated into your test rig or application. 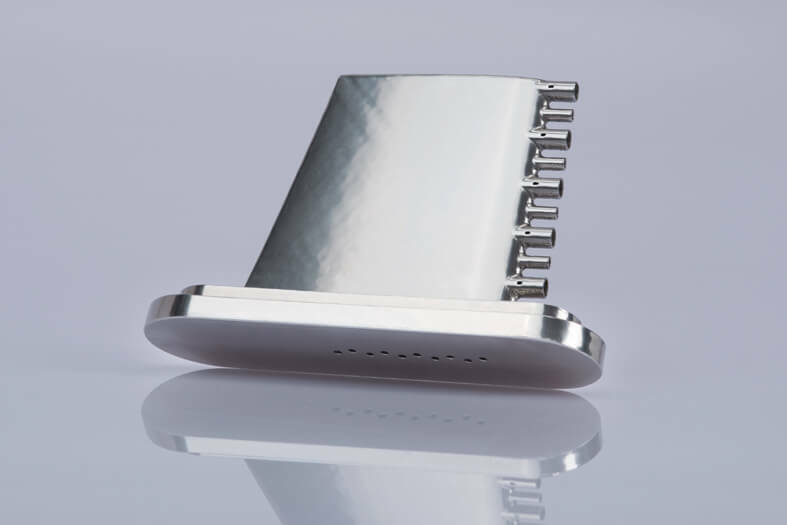 With Vectoflow's manufacturing process, you are able to flexibly customize your probe geometry. The probe head can be as small as 0.9 mm and lengths of up to 250 mm are standard. A square or hex-shaped reference surface allows you to attach your probe to your system without changing your set up. Currently we are developing an easy connector to attach to the flexible pressure lines. Straight: Straight probes are mainly used in the field of UAVs or in the automotive area. L-shaped probes: Examples for the application of L-shaped probes are jet engines, gas turbines or auto racing. Cobra: The main advantage of cobra-shaped probes is that the probe tip remains in the same location as the probe shaft is rotated. This is expecially advantageous when wanting to rotate a probe to gain additional measurement range (> 60°) or when calibrating a probe. "Drilled Elbow": The `Drilled Elbow´ geometry is often chosen if the probe must fit into a narrow hole to put the probe head at the measurement position. This is often used in jet engines where access and space is limited. Different probe tip shapes are possible. Conical and hemispherical heads are standard. Other application specific geometries are also possible. The following specifications are dependent on geometry, material, head shape, used pressure sensors and data acquisition. The core of the post-processing software is a library file, which can be integrated in any custom code. It calculates the velocity vector as well as the static and total pressure from the pressure measurement at the probe head. Additionally, a software package will be available which offers GUI-based post-processing functions including batch processing. A professional calibration is essential for aerodynamic measurement devices and to produce reliable data. It defines the relationship between the pressure measured at the probe head and the velocity vector. All flow probes are calibrated in our calibration wind tunnel to the customer's specified speed ranges. Do you need a special solution for your application? We are looking forward to your inquiry and will design a probe or system to your needs.